Map co-ordinates of cursor (Map view only). This shows the $Xpos/$Ypos map co-ordinates of the map cursor when right-clicked. In other views this entry is a blank line. Map view only: Create Adornment. Creates a new adornment, with top left corner in the context-clicked position. 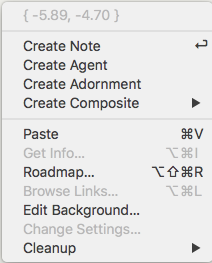 Outline view only: Create Separator. Creates a new separator at the top of the current outline; for hoisted containers it is created as the first item within the root container of the view. All other views. Greyed out, labelled as 'Create Separator'. Create Composite. Map view only - greyed out in all other views. Shows a sub-menu of currently defined composites. Edit Background… (Map, Outline and chart only). Opens the Edit Background pop-over. Change Settings… (Timeline only). Opens the Timeline Settings pop-over.